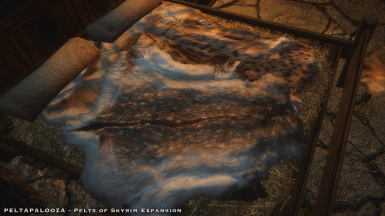 This mod expands from the 3 default pelt used in farmhouses and inns to have as many as 9 different pelts in the game at one time. There are different sets for the floors, walls, and beds. There is also a Lite version that has a shared set for the walls and beds, and a separate set for the floors. 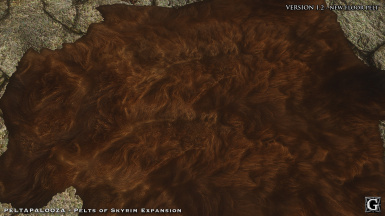 Do not use the textures from this mod without my permission. All my mods are exclusive to Nexus. 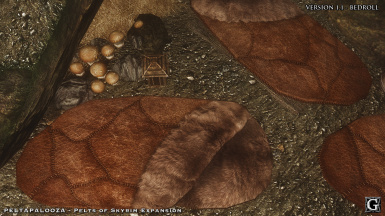 Thanks to Bethesda for creating Skyrim, and making the high-resolution packs available, which some of these textures are based on. Thanks to Textures.com for being an invaluable photographic resource. Thanks to Nexus for providing an invaluable resource to mod authors. 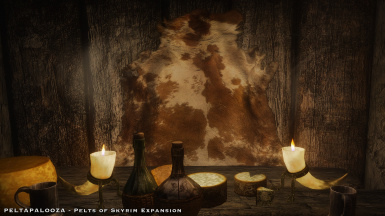 SHORT STORY - PELTAPALOOZA is an expansion on my earlier mod Pelts of Skyrim. This increases the number of pelts used by the game from the default 3, to 9. 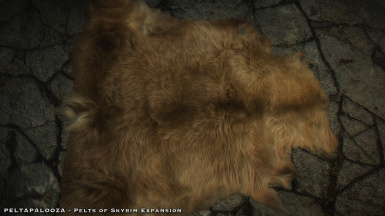 Skyrim's pelts are controlled by three sets of (3) meshes: wall pelts, bed pelts, and floor pelts. 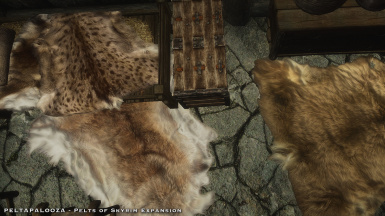 I've assigned new textures to all three sets to allow 9 pelts to be used. There is also a Lite version that uses the same set for both the walls and beds, and a separate set for the floors, so only 6 pelts are used. This is for people with low-end PCs who can't handle the extra texture load. 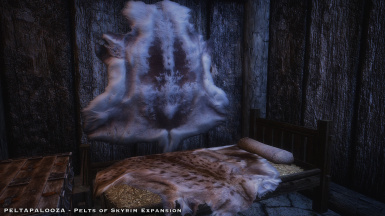 Wall and bed pelt textures are 1024x2048, and the floor pelt textures are 2048x2048. 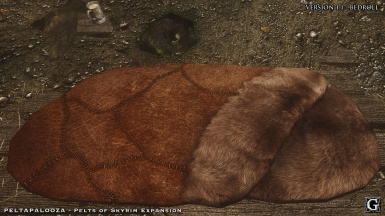 A retexture of the bedroll is also included with this mod. 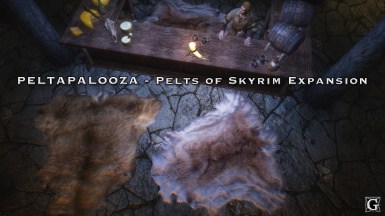 LONG STORY - PELTAPALOOZA grew out of my Pelts of Skyrim mod, which I made originally because I disliked the default Bethesda pelt textures. They were too bland and generic looking, even at the hi-res pack size. 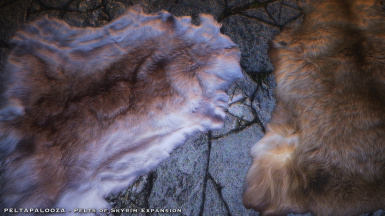 So, I designed 4 sets of the three pelt textures to give people options in decorating their game. 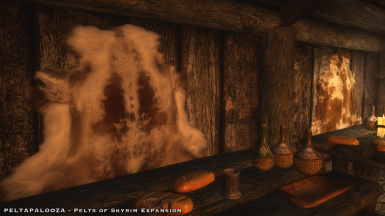 I always thought of the pelts as the "artwork" of the inns and taverns. 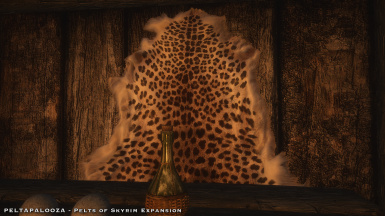 My aim was to create pelts that were both attractive and distinctive. 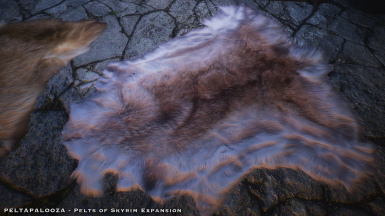 One nagging issue remaining was that only one set of (3) pelt textures could be used in the game. It was great to have choice, but the limitation of only being able to use three at a time was annoying. The other issue, was the floor pelts. 1024x2048 was perfectly sufficient for the wall and bed pelts, but the scaling of the floor pelts made them often stretched and blurry looking. What the floors needed was a real 2K texture. After much experimentation, I discovered that while the wall and bed textures needed to be their original 1x2 (1024x2048) dimension to display properly in game, the floor textures did not. The meshes allowed the textures to be in the normal 1X1 dimensions. This was important, because I wanted to expand the pelts used by the game in the most performance friendly fashion as possible. Pelt textures are double layer to begin with, so there's a significant VRAM savings having 2048x2048 textures instead of 2048x4096 textures. I also determined that since my original textures were designed to work with the default normal maps, that I could eliminate one set of normals, by having the walls and beds share the same normal maps. That eliminated adding an extra set of 1024x2048 textures. As with all my mods, performance is always a major consideration. I want my mods to be useable for as many people as possible. 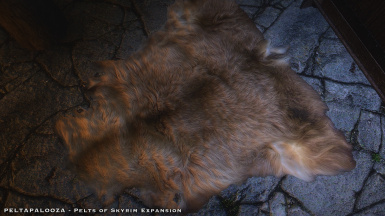 Another thing that bothered me was the default normal maps were lacking in depth, and made the pelts look more like cardboard cutouts (especially on the floors). 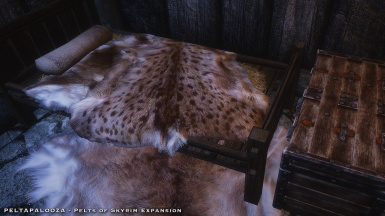 For PELTAPALOOZA, I dispensed with the original normals, and made new normal maps that were universal enough to be shared between the pelts on the walls and beds. For the floor pelts, I endeavored to create unique normals that had real dimension and a sense of softness to them. 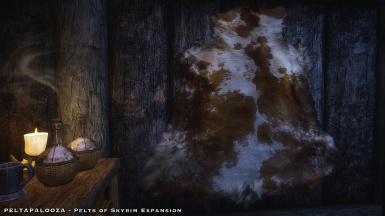 Farmhouses are made up of rough wood and stone textures, and I wanted contrast with the pelts. Fur should be soft and have loft to it. I tried to get that appearance into these new textures. OK, so when is this longwinded business over? Almost, I promise. The meshes also required some adjustment of the UV scaling to better display the textures without stretching. 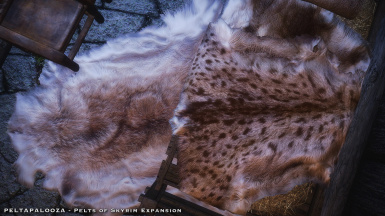 The original meshes treat all the pelts the same, but they aren't being used in an identical fashion. 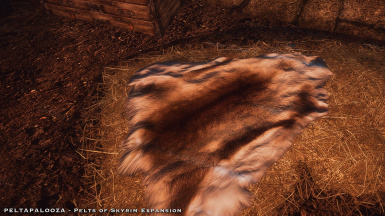 The floor pelt meshes now scale 100% of the new square textures, so they look nice and sharp in the game without distortion. It all comes down to choice, what your setup can handle. 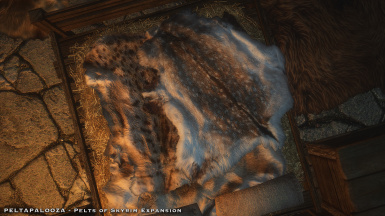 If you can play with hi-res textures and have a good gaming rig, then download the Full version and get all 9 pelts in your game. 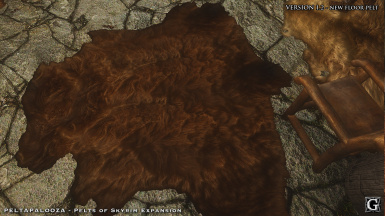 For those with less robust PCs, download the Lite version, which gives you 6 pelts in the game. You'll get the sharp detailed floor pelts with a shared set between the walls and beds. If you've made it this far, then I thank you for your patience. PELTAPALOOZA is my attempt to bring more life and color to the game that we love - Skyrim.